Scars are more than a symbol of something that has happened in the past. Whether they are actual physical scars that can be seen on the outside, or are internal scars from tragedy or loss in the past – we all have scars. 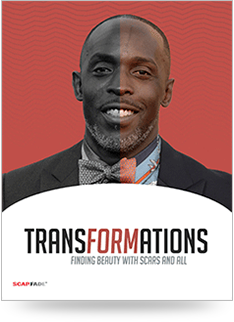 What is great about scars, is that they can be inspiration to transform your life – whether it’s your home, career, or body, to make a change for the better. We have followed the stories of the following people to learn and grow from their transformation stories. How they have taken their scars and changed their life for the better, whether they have transformed their scars into artwork, turned their careers around, or turned a house into a home. While scars happen for different reasons, and they each affect us in a different way – it’s all about how you react to the scar. You can own it, or you can let it own you. There are scar treatments out there, like ScarFade that can help reduce the appearance of the scar – while allowing you to still transform your life because of it. To achieve best results one must use Scarfade daily for several weeks. We recommend 12 weeks as a general rule of thumb.